While I’m in Nepal, my wife Jennifer and my daughter Gwendolyn are visiting Jen’s family in Thunderbay. Jen’s mom is travelling with them – they drove up this past week and have safely arrived and are having a lovely time. Jen was kind enough to send some photos of their trip – I’m having a wonderful time in Nepal, but I do miss my girls terribly. It will be wonderful to return to them at the end of the month. 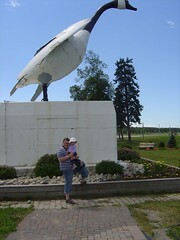 Here is Jen and Gwen at the Goose in Wawa, Ontario – on they way to Thunder Bay. That shot of Gwen in the pool is adorable. I’ve never seen a smile that big before.